The first theatrical performance on a brand new stage. How often do you get to see that? And right on the Hudson River. 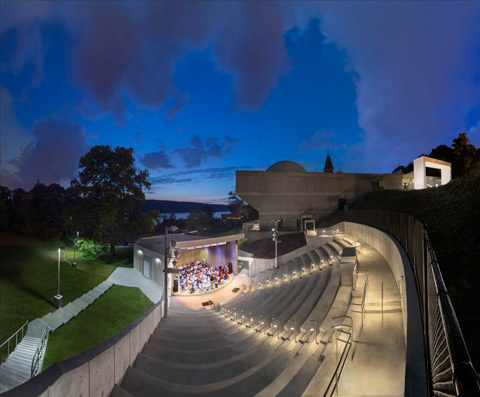 The Hudson River Museum in Yonkers, New York, opened its new amphitheatre July 4th with music and fireworks. In this its first season it has on deck jazz, films, birds of prey, a bit of everything for families. Which is, it would seem, a show that is intellectually available to an audience of all ages. Will the six year olds here tonight, running around and wiggling before the show, get it? 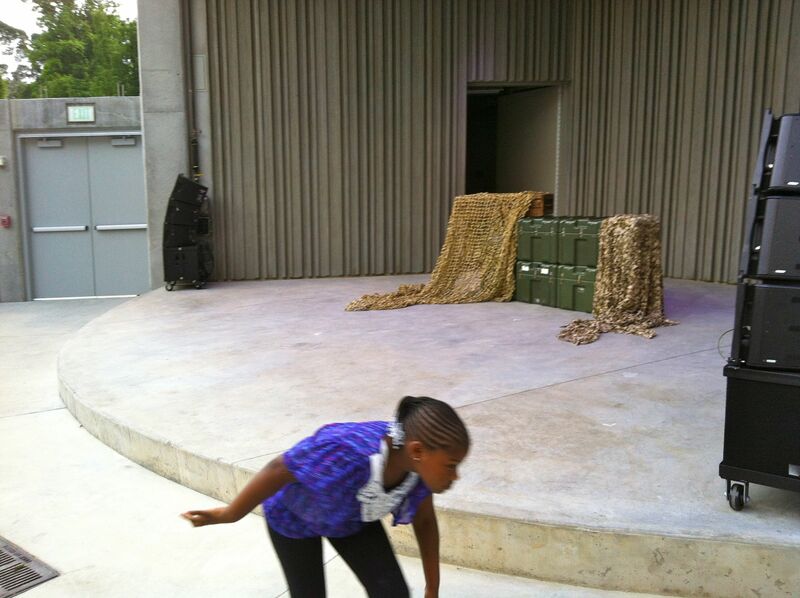 This Othello is staged on a U.S. Army base in Cypress. 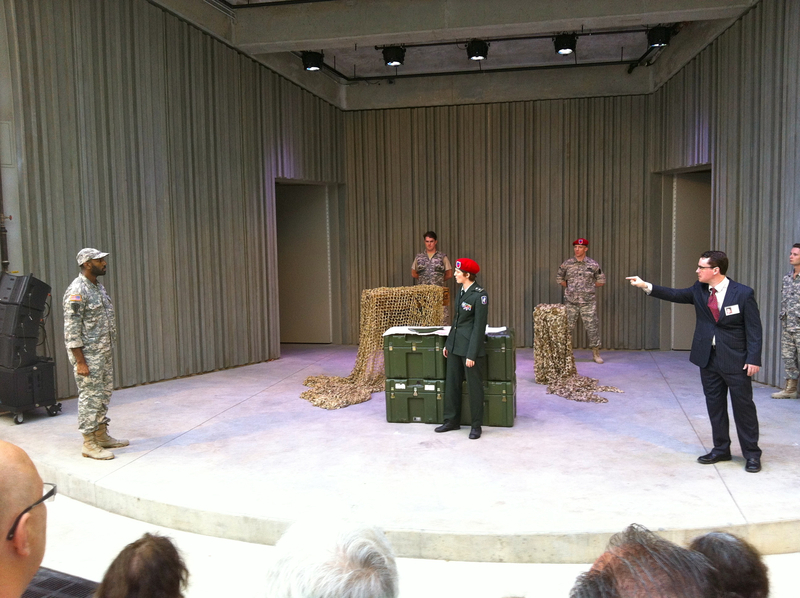 I’ve learned that this is a trend in Othello productions, to make the military contemporary and American. No tights for the guys. The production comes to us from the Hudson Valley Shakespeare Education Tour, an arm of the plein-air Hudson Valley Shakespeare Festival in Garrison, New York. The company has just come off a busy season visiting schools in the region, and this Othello has been condensed by half its normal three hours to cater to the attention span of adolescents. Much as I appreciate Shakespeare, I am happy with the brevity. 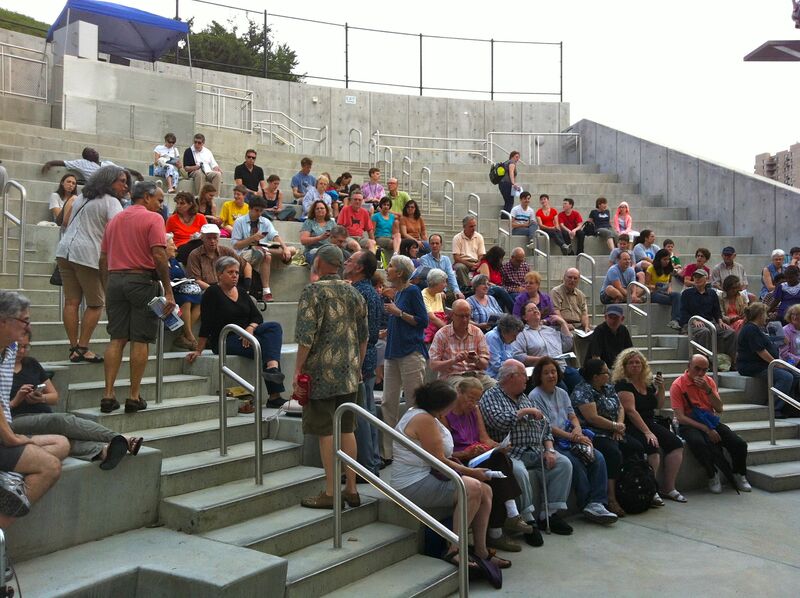 The audience trickles in and waits, cheerfully laying out cushions, chatting with neighbors. The director of the Festival is seated in the row in front of us, in a polka-dotted shirt, looking as anticipatory as the rest of us, gazing at the unpeopled, abstract stage and waiting for the action. Desdemona is sweet. 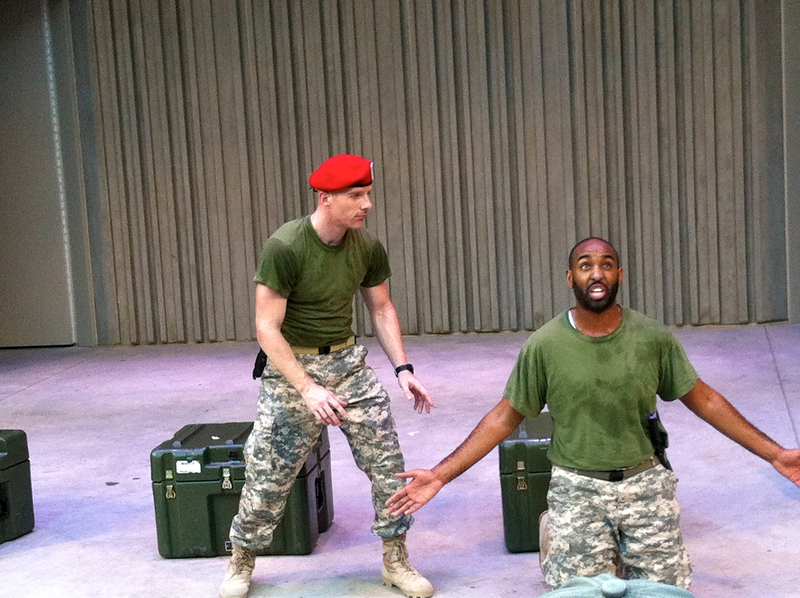 Othello is somehow sensitive and soulful, for a big-shot general. And Iago – well, his motiveless malignity, as Coleridge described it, is a particular kind of sneering, sleek, macho variety, very now. The characters leap up and down the concrete seating that angles back from the stage. Thus when Iago pronounces one of his horrid asides we are literally right there with him, face to face. And at the end… well, I won’t spoil it for you. It’s devastating. The six year olds all watch movies, play video games. Is the tragedy as meaningful for them? Shakespeare, you know, invented words. Over 1,700 of them, to be exact, including nouns made into verbs, verbs into adjectives, and connecting words. Assassination. Arouse. Gloomy. Eyeball. Just a few of the nomenclatures we wouldn’t have if it weren’t for the Bard. Part of the reason for the volume of the inventions, and simply of his vocabulary, is the sheer amount of published works he produced. Scholars have pinpointed the created words and linked them to the plays and poems they’re in. If not for Shakespeare our speech today would be much the paltrier. And if it weren’t for Shakespeare we wouldn’t be sitting in the warm dusk on the steps of the Hudson River Museum’s Amphitheater in mid-summer, marvelling at this demonic human Iago. Motiveless malignity. We have far too much of that today. After the play the actors took the stage for a q and a. I suggested that it looked as if Iago’s William Allgood was having a good time putting on his role and asked if he would reflect on that. He looked surprised and a little dismayed. He hadn’t seen it as fun, he said, he was trying to take the character seriously in a different way than he had in previous productions, to give a deeper take on Iago’s psychological roots. So it may have looked as if he was having fun, he said, but he was in fact working. Well… researching and writing are rewarding, as is the fact of having written something and feeling good about it. It’s nice when other people read your work. The worst thing? Not getting paid on time. I wonder … do you find your work fun? You do such a good job, both on books and on your blog. Surely you must find the blog fun, but the writing of books … do you find that fun? I can imagine that there must be parts of what you do that, well, aren’t as much fun. What do you find the least fun about writing?